In the end I only saw three films in this year's Jameson Dublin International Film Festival, but they were all worth it in their own ways, so it was a bit of a result. Both mrmonkey and I were excited to see the new Whit Stillman film, Damsels in Distress, because I like Whit Stillman and he likes pretty ladies and we both like films that build a world slightly removed from reality but still recognisable as an internally consistent universe, with its own hierarchies and rules and idiosyncratic language. The film opens with a standard gambit for a film featuring young women in an educational setting: an established group seeks out a newcomer and tries to change her to fit in with the group and to better fit in with the college as a whole. However, the established group turn out to be more than a little outside the mainstream themselves and have their own problems trying to deal with the manipulative and/or stupid males they're trying so hard to make sense of. The good news is, though, that the members of the group turn out to be genuinely well-meaning, if completely idiotic, and they really do want to help each other make their way in this small world in order to prepare themselves for making their way in the larger one outside. They make some bad choices, they are taken advantage of, they experience some triumphs, and on the whole you find yourself rooting for them, especially since many of the actors come from a particular set of television shows that feed so well into this kind of film: Parks & Recreation, 90210, Gilmore Girls, The OC, etc. Even still, for a film that is just an hour and a half long, Damsels in Distress outstays its welcome. It's too whimsical, too slight, too insubstantial, with too little to say about anything to bear the weight of watching it in the cinema, never mind watching it in the cinema with the director sitting right over there, waiting for people to ask him questions about it. I just kept wondering what the point of it was. I'll probably love it when I see it again on television. Stillman seemed like an affable enough guy, but either the interview was badly conducted or he was tired or people just didn't have a lot to ask him, because the Q&A session wasn't particularly interesting or illuminating. 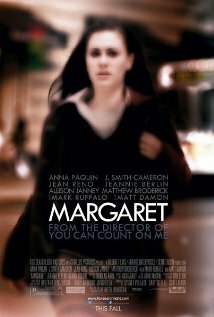 Another distinctive auteur showing his movie about young women trying to make their way in the world was Kenneth Lonergan, who was on hand to answer questions about his film, Margaret, which stars Anna Paquin as a teenager who is involved in a bus crash that kills a pedestrian. The film charts her attempts to deal with this event while she is negotiating the general life issues associated with someone growing up in New York after 9/11, attending a small private school on a half-scholarship, with parents who are too wrapped up in themselves to really notice what's happening in the lives of their children until the problems become too acute and noisy to ignore any longer. At two and a half hours, this film is definitely longer than it needs to be, but it is so absorbing and beautiful that it not only gets away with it, but is probably worth a rewatch (and will be getting one as soon as I can get the DVD). Lonergan himself was an entertaining speaker, gracious in accepting praise, honest (or seemingly honest, anyway) and forthcoming about creative decisions, and funny. Margaret has been pretty comprehensively discussed elsewhere on the Internet so I don't need to go into a lot more detail about it here: here's an article on Hitfix about the authenticity of its treatment of privileged high-school students, here's one from the Guardian about the studio allegedly trying to bury it, and here's a good interview with Lonergan from Movies.ie (the interviewer didn't like the movie one bit). 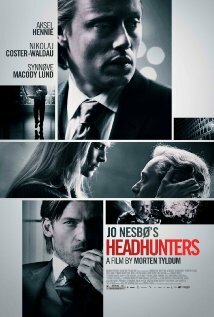 The last movie I saw was Headhunters, mostly for research purposes, I will admit. This Norwegian thriller, directed by Morten Tyldum, starring a whole bunch of Norwegian people (and Nicolaj Coster-Waldau), and based on a book by Jo Nesbo, is a good time if you like fast-paced action interspersed with extremely crunchy violence. The main character, Roger Brown, is a corporate headhunter who, in order to compensate for feelings of personal inadequacy and maintain a lavish lifestyle, steals expensive art works from wealthy clients. His wife introduces him to the mysterious and creepy Clas Greve, and while trying to steal an original Rubens from Greves's Oslo apartment, Brown discovers secrets about Greve, and these secrets don't lead anywhere good for anyone. There's a lot of running about in the Norwegian countryside, a fair amount of tension, menacing looks, nice suits, finger-breaking, and commentary on identity and self-perception. Overall my experience of this year's JDIFF was reasonably positive, except that both the night-time films I went to started late, which is annoying when you've got to get the last bus home and you don't like standing around in big groups of people for long periods of time, and the website was just too hard to navigate. I couldn't find a search box on the home page, for example (but maybe I'm just thick). Also, on behalf of people like Dave & Aoife, who've been supporting the festival for years, can I ask the organisers to either book a decent surprise movie or just give up? Hamlet 2, Greenberg, and This Must Be the Place? These are not good films and you shouldn't be charging people festival prices to see them.